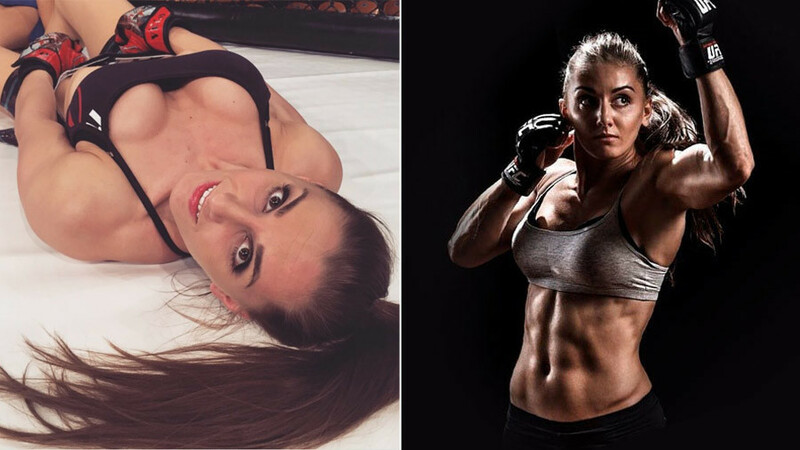 UFC strawweight Alexandra 'Stitch' Albu might not be the most famous name representing Russia, but that could change as she continues to work her way up the promotion and catch the eye with her revealing Instagram photos. The 27-year-old native of the Moldovan village of Vulcănești, Albu, made her debut in the UFC octagon in April 2015, beating her opponent from Poland, Izabela Badurek, via guillotine choke. She then took a two-year break forced by an injury. Coming back in July 2017, she scored another victory, this time via unanimous decision, when taking part on the star-stacked UFC 214 card. But fighting alongside the stars did not distract Albu, who adopted her fighting moniker ‘Stitch’ from a popular cartoon character. You last fought on the UFC 214 card in the summer. That was a pretty impressive card: a top fight with Jon Jones against Cormier, Chris Cyborg, Tyron Woodley. How did you find participating on that card with such outstanding fighters? I was thinking about my performance and the weight cut before the fight, I didn’t pay attention to the other things. When you are about to take part in an event you’ve been preparing for for such a long time, you don’t pay too much attention to the other things. Although one thing that I remember was the fact that my coach couldn’t come to the States. He had some visa problems. And it was quite difficult for me to fight without him cornering me. At the end of December Cris Cyborg defended her belt. How would you rate her performance? I’ve always liked Cris. Plus we know each other personally. I had no doubts she was going to defend her belt. Do you see anyone who could potentially take her belt in the near future? Women’s MMA is gaining momentum really fast and it’s becoming more and more popular. Women’s divisions are getting bigger, and of course some sort of competition will occur. Recently in your own weight class we witnessed a change in champion, when Rose Namajunas defeated Joanna Jedrzejczyk. Were you surprised with the outcome of that fight? It didn’t surprise me. Rose is also very strong and a tough fighter, she worked very hard and now it’s her time. Do you see yourself fighting against Joanna or Rose in the future? Who in your opinion would present the most problems for you? Yes, I see myself fighting against both of them. We are all in the same weight category, so it’s inevitable. It’s only a matter of time. Talking about their level, I can say that all the fights are tough for me. Fighting is a pretty tough job, you know. Do you know roughly when you’ll be back in the octagon? I suppose it will happen this spring. For the next fight after that I can’t really predict anything. We know that originally you come from Moldova, but at the moment you live in Moscow and represent Russia. Do have plans to obtain Russian citizenship? Yes, I’m still a Moldavian citizen, but I’d like to get a Russian passport. That’s what I’m working on now, but unfortunately it’s not as easy as it might seem. Could you tell us about the moment you decided to start practicing MMA? We know that you practiced karate originally. I decided to become a professional MMA fighter after I moved to Russia. I met Andrey Tsarkov, the head coach of the MMA-KEGI fight club, which I represent now. I’d been thinking a lot about my previous martial arts experience, and I didn’t want to just waste all that time that I’d spent learning it. However, MMA is absolutely different. You can’t really compare it with karate. So it took me a few years to hard work and to learn how to fight differently, I had to change my stance, striking technique, and many other things. Some time ago you said that you combined two training sessions per day with coaching work. Do you still work as a coach? Yes, I have to combine my work and two training sessions a day. It’s pretty difficult, I always want to sleep. When I have my rest days I can allow myself to combine work and just one training session. Do you think it’s partially connected with the fact that it’s difficult for a female fighter to find sponsorship in Russia? Finding sponsorship isn’t easy indeed. Usually it doesn’t go further than talks. I don’t know whether it’s more difficult for girls, there are not so many examples. But this sport is still developing, so I hope that one day it will be become better. Male fighters often receive financial support by joining certain teams, and then representing them. Did you get any offers of that kind? No, I haven’t had such offers. But I’m not interested, since I have no intention of changing team. I’ve been with the MMA-KEGI team from day one, and I’m happy to be a part of it. And what about advertising? Some female fighters get extra money from that. Have you ever received any offers? Speaking about advertising, yes, I had several offers from commercial companies and we even came to agreements. On your Instagram profile you have quite provocative photos and videos. Is that your strategy? Something that you do purposely? You know, I don’t have anyone doing my social media for me. So my Instagram depends on my mood. I’m a live human being. I post whatever I feel should be on my page. I don’t see the point of checking with someone else’s opinion. I suppose that visual attractiveness has an impact on a female fighter’s popularity. What other difficulties does a female fighter face doing MMA professionally? I can’t say anything certain about it. The hardest part is the same for everyone, actually. Just the everyday hard work at the gym.